The Delta Mariner, a 312-foot cargo vessel, draped in debris from the Eggner’s Ferry Bridge. Photo by David Maddox/Marshall County Sheriff's Office. 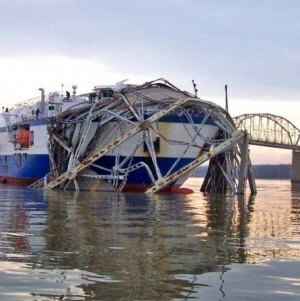 2012: A 300-foot-wide section of the US Highway 68/KY Highway 80 Eggner’s Ferry Bridge collapses after Delta Mariner, a 312-foot cargo vessel carrying Atlas first stage and Centaur upper stage rockets, plows through the center span. No one is injured on either the bridge or boat. 1999: The National Transportation Safety Board concludes that singer/songwriter John Denver died in a 1997 plane crash because he took off with too little fuel in one gas tank, had trouble switching to the backup tank, and put his experimental craft into a roll while trying to make the change. 1700: A megaquake with a magnitude estimated at 9.0 rocks the Pacific Northwest, rupturing the Cascadia subduction zone and shaking the region for a minute or more. The earthquake drops the coastline of Washington three to six feet and generates a trans-ocean tsunami that strikes the east coast of the main island of Japan.